Cheap and discounted kitchen cabinets are an affordable way to update your kitchen. Change the appearance of the room by adding a whole new set of cabinets or by simply refacing the old set. The good news is that it's not too difficult to find inexpensive kitchen cabinets, as long as you know where to look. Discontinued products: Manufacturers discontinue products all the time. When this happens, retailers want to move the old product to make way for the new. What isn't sold at a "normal" retailer is then sent to the discount retailer. Floor models: Kitchen cabinets used for floor models in showrooms are also sold at discount stores because they aren't considered new. Slightly damaged: Cabinets that are slightly damaged, either through handling at the warehouse or during shipping, are also offered at a steep discount rate. These dings and scratches are rarely noticeable. Many times, in fact, the damage is in a place that cannot be seen, like in the back of the cabinetry. Returns and mis-orders: Sometimes a customer changes his or her mind after ordering and the cabinets are returned. They may be sold at a discounted price to help move them and make space. Materials: You'll pay a lot more for a cabinet box made of solid wood than you will for one made of MDF with a wood face. 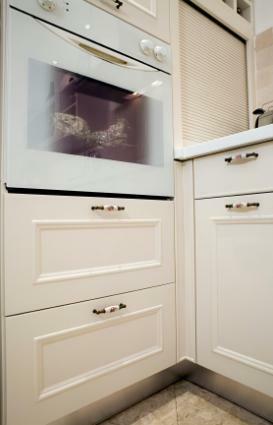 These cabinets are not bad quality, but they may have thin veneers that are visible as fake upon close inspection. Off-the-rack: Most kitchen cabinets are custom built to order. The builder takes into account the small details of your space and how they will all fit. They may be custom stained or painted as well. It is possible, though, to find readymade cabinets at a less expensive price if you aren't as choosy about finish or final fit. Try to buy cabinets made of solid wood. Cabinets made mostly of MDF will have a shorter lifespan and a less appealing finish to them. They may also not be as sturdy; shelves may sag and doors may go out of plumb over time. Cabinets with turn tables, corner pieces, glass doors and other bells and whistles cost more money. Consider avoiding these special options to save money. Even though you're buying cheap kitchen cabinets, it's best to have a warranty. A warranty will offer protection in case the cabinets don't hold up. It might even be worth it to purchase an extended warranty. You may have to hunt and do some comparison shopping to get the best price on good quality cabinets, but there are options out there for finding cabinets at a lower price. Unfinished furniture shops sell quality pieces at a discount because the cabinets haven't been stained or painted. Secondhand furniture shops, architectural salvage and antique stores, and even thrift shops all sell previously owned kitchen cabinets. You might not want to have another person's kitchen cabinets, but if they're in good condition, it shouldn't matter. A coat of paint or stain will have them looking as good as new. Home improvement centers often have sales. Sometimes there are great bargains, especially with older, outdated models. Speak to manufacturers and kitchen design centers about their odd lot. Nearly every store has one; it's where the returned products are brought to be sold at a lower price. Direct Buy Kitchen Cabinets advertises quality cabinets at a discount. Sears Home Improvements is a name you can trust. Expect quality merchandise and installation. When Sears has a sale, there are plenty of bargains to be had. In Stock Kitchens has a wide variety of cabinets ready to ship. Because they aren't custom, they are frequently less expensive while still offering quality. Cabinet Liquidators ships right from the factory, so you can avoid middleman pricing. The Cabinet Factory sells preassembled kitchen cabinets that ship directly to you. Be very clear with your measurements to ensure a good fit. Kitchens Pro offers solid wood cabinetry at a lower cost than custom built. Kitchen Cabinet Mart offers free samples so you can examine the wood before making a choice. Keep in mind that while you may be saving money on the cabinets, you could end up paying more in the end. Pay careful attention to the details to avoid unpleasant surprises. Check the following before you purchase to ensure you are getting what you pay for. Does your installer work with this brand? Not all cabinets and materials are created equally; make sure the person you are trusting to install your cabinets has familiarity with what you choose. Did you double check your measurements? By ordering from a discounted vendor or purchasing odd lot or secondhand cabinets, you may not get a second chance on the fit if you don't measure carefully. Are fillers available? Nearly every kitchen requires filler strips at some point to help make the fit perfect. Can you get filler strips in the same color to help complete the design? Can you get extra stain? Nicks, marks and scuffs happen in kitchens; can you get a can of the same color stain or paint from the manufacturer to have on hand for touch ups as the years go by? Remember that a kitchen design should last between 20 and 30 years before it needs to be redone. Get the best quality cabinets you can afford to help ensure your new cabinets last as long as possible.